This Pumpkin Bread Pudding with Brown Sugar Caramel Sauce is warm, cozy, and perfect for dessert. It’s easy to make, packed with simple ingredients, and topped with an easy caramel sauce. 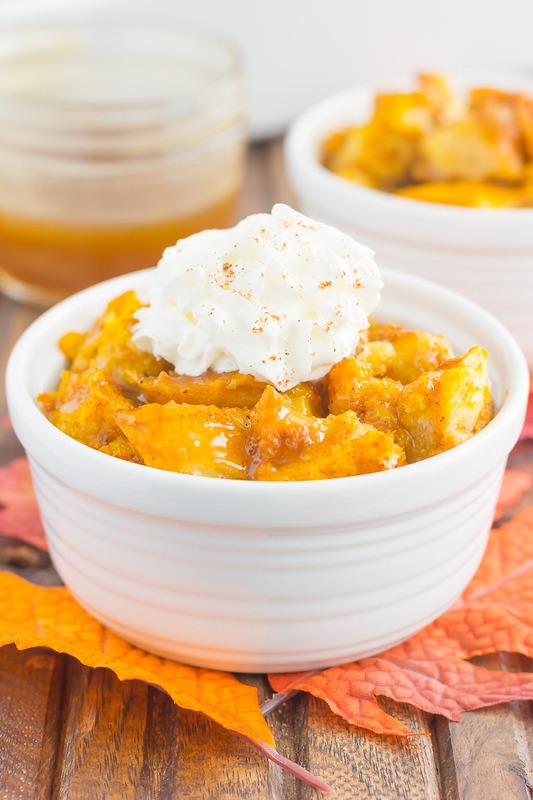 This pumpkin dish is guaranteed to be a favorite all year long! We’re smack dab in the middle of fall and I’m loving it! 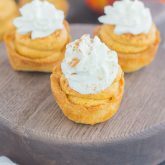 The cool weather, pumpkin spice lattes, cute fall decor, and all of the apple and pumpkin goodies that I can get my hands on…what could be better? But, you know what? We’re only about a month away from Thanksgiving! I know, I know…maybe I shouldn’t have brought this up just yet. But, this Pumpkin Bread Pudding with Brown Sugar Caramel Sauce made me think of serving this for a holiday dessert. And since Thanksgiving really isn’t too far off, this would be a great addition to your table. Or for breakfast. Or dessert. For today. And tomorrow. Basically, all year long because it’s so good! If you’re a fan of bread puddings, then you’re in for a real treat! This dish is filled with the flavors of fall and all of that rich, pumpkin-y goodness. Plus, it’s like the perfect comfort dessert. Thick chunks of bread, coated in a sweet pumpkin custard, and then baked until perfection. It’s like biting into perfect, pumpkin-y pillows of flavor! And that brown sugar caramel sauce…we can’t forget about that! Unlike traditional caramel sauces (like this Salted Caramel Sauce), this one can be whipped up and ready to go in less than five minutes. It’s sweet, decadent, and oh-so delicious when spooned warm over the bread pudding. And I won’t tell if you dig in with just your spoon! 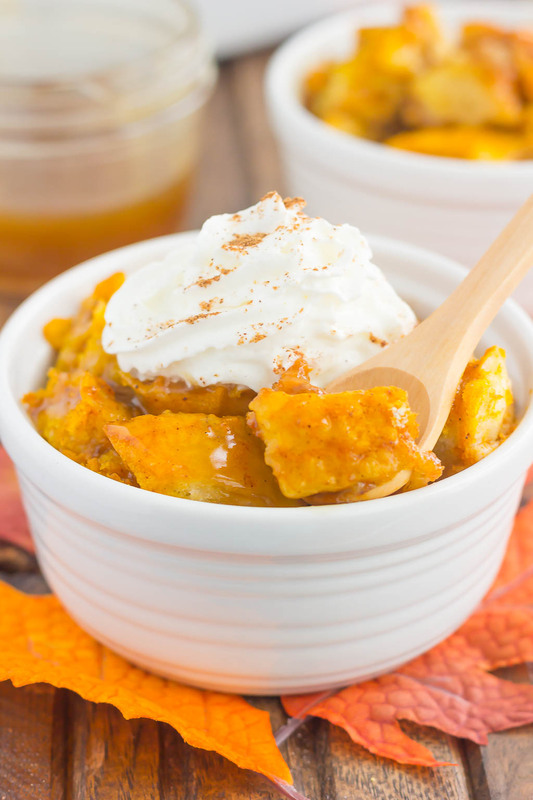 This Pumpkin Bread Pudding with Brown Sugar Caramel Sauce is guaranteed to knock your socks off for dessert, or even for breakfast! It tastes great when reheated, and is delicious when served with a dollop (or three) of whipped cream. And the best part? It can be prepped ahead of time, so all you have to do is to pop the bread pudding into the oven when you’re ready to go. Even the brown sugar caramel sauce…I usually make this a day ahead of time, let it cool, and then store in a glass jar in the fridge until ready to serve. Then, just pop it in the microwave and drizzle over that warm, gooey bread pudding. 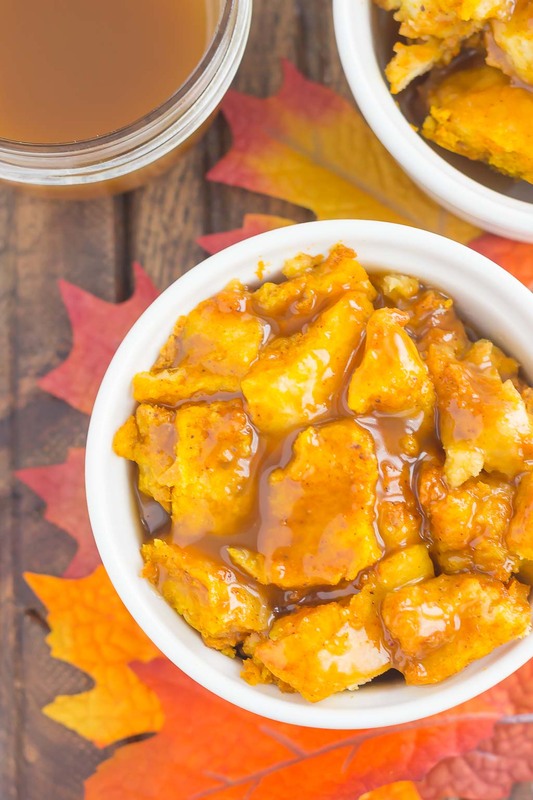 So if you’re looking for that perfect Thanksgiving dish, are just in need of some pumpkin-y deliciousness, or have some leftover bread to use, this Pumpkin Bread Pudding with Brown Sugar Caramel Sauce is guaranteed to be a household favorite! This Pumpkin Bread Pudding with Brown Sugar Caramel Sauce is warm, cozy, and perfect for dessert. It's easy to make, packed with simple ingredients, and topped with an easy caramel sauce. 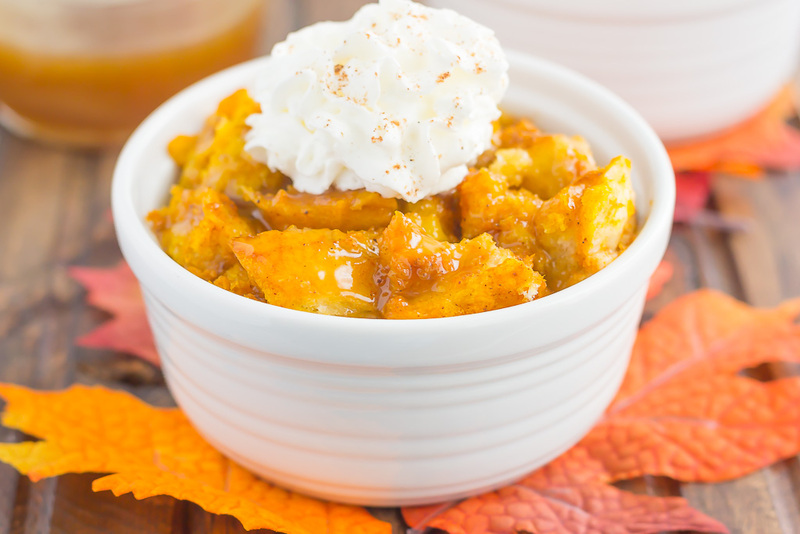 This pumpkin dish is guaranteed to be a favorite all year long! Preheat oven to 350F. Lightly grease a 3-quart baking dish with non-stick cooking spray. Place bread cubes evenly in dish and set aside. 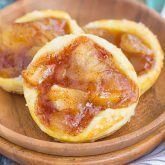 In a large bowl, beat eggs and sugar with an electric hand mixer or stand mixer with fitted paddle attachment until light and fluffy, about 2-3 minutes. Add pumpkin, heavy whipping cream, allspice, nutmeg, cloves, and salt. Beat until combined. Pour mixture evenly over bread cubes and lightly press down to ensure each piece is coated with mixture. Let stand for about 8-10 minutes, or until bread has soaked up most of the liquid. Sprinkle 1/4 cup butter chunks evenly over bread mixture. Bake for 30-32 minutes, or until set and edges are slightly browned. To make caramel sauce, melt butter over medium in a small saucepan. Add brown sugar and heavy whipping cream and whisk until sugar is completely dissolved, about 1-2 minutes. The bread pudding can be prepped and refrigerated for up to one day in advance before baking. The brown sugar caramel sauce can be made up to two days ahead of time and then refrigerated. I love that this can be prepped ahead! These are the cozy flavors of autumn that we love! And I'd put that caramel sauce on everything! Pinned! Make-ahead dishes are the best! Thanks, Annie! I second Annie! And you know I love fall too, especially the cozy fall comfort food! I can see so many uses for this caramel sauce...maybe a little too many, lol! Pinned! Have a great week, my friend! This caramel sauce is SO addicting! :) Thanks, Dawn! Oh, man...I LOVE a good bread pudding for dessert! This pumpkin version is genius! So perfect for the fall! I seriously can't believe we are a month from Thanksgiving!! Before we know it, it's going to be 2018!! Whaaaaat? Crazy! Anyways, loving this Pumpkin Bread Pudding!!! I could legit drink that Brown Sugar Caramel Sauce with a straw!! Pinning to try! Cheers! Time is going by WAY too fast! Thanks, Cheyanne! 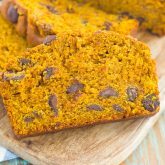 Bread pudding is one of my most favorite foods but I've never used pumpkin. I'm going to make it and make sure it's good before sharing!! This was my first time trying pumpkin in bread pudding, and it was delicious! I hope you love this, Judy! 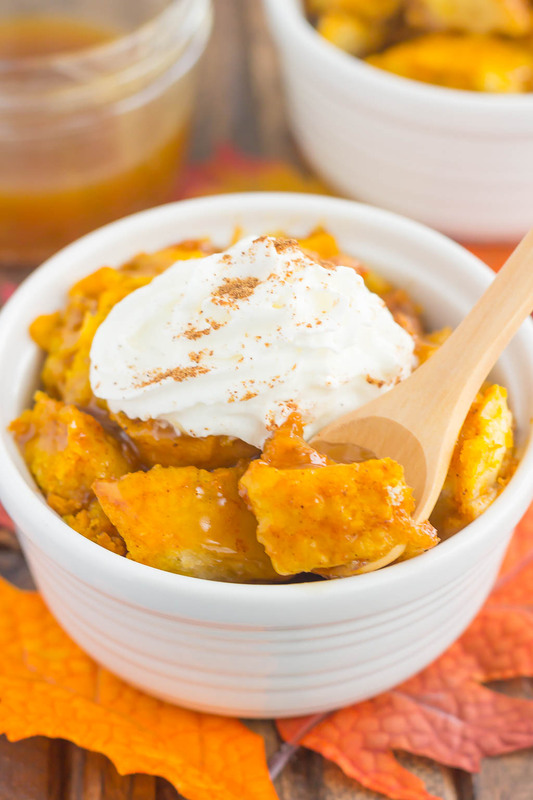 I'm OBSESSED with bread pudding right now and this pumpkin version looks so unbelievably good, Gayle! 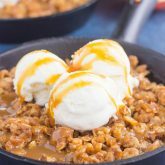 That caramel sauce is making me swoon right now! It hasn't been very fall-like here, but I think tomorrow it's finally supposed to cool down and feel more like fall. At this rate, it will be Thanksgiving before it feels like fall! You had me at caramel with this bread pudding, Gayle! Pumpkin and caramel is one of my favorite fall combos, and this looks just perfect. We've had summer-like weather here too until yesterday, now it's cold and rainy! Thanks for the bread pudding love, Keri! This is just perfect for Fall! Love the colors! Such a delicious combination, can't wait to try this Bread Pudding! I've been thinking about Thanksgiving since September...I have it bad! haha Bread pudding is a favorite around here and this would be the ultimate Thanksgiving dessert! I love that caramel sauce! It's hard not to think about Thanksgiving and all of the food, right? :) Thanks, Marcie!